A staple of the sixthreezero lineup and one of the originals, the ever popular Scholar Woman is tough not to love. 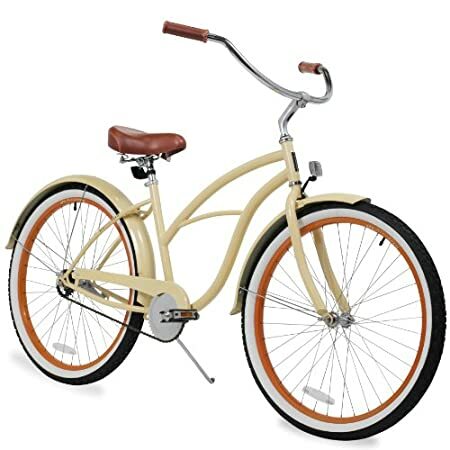 This is a standard 17-inch women’s cruiser frame and the color scheme on this one really depicts a sense of style and even sophistication. This one is a gorgeously colored bike, accented beautifully by the rims within the 26-inch white wall tires. More than that, it comes with a really comfortable and clean-looking saddle and grips, both stitched. Matching front and rear fenders always add a nice touch too, not to mention protecting you from any puddles you may come across. Beyond the good looks of the bike though, this single speed will definitely get you where you need to go, assuming you don’t need to climb Machu Picchu. With the optimal crankset configuration, pedaling around most places has never been easier. A single speed bike that is as reliable and efficient as it is scholarly. Look at this beauty. 3″ thick and 26″ big tires for great rides in town!